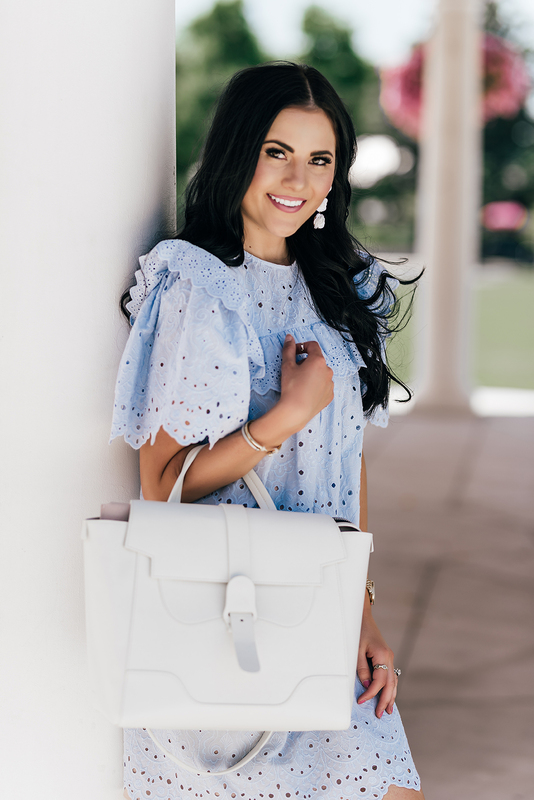 My favorite accessory has ALWAYS been handbags! Whenever I’m shopping the handbag department is always the first place I go. I love them because you can get so much use out of them, way more than clothing or most shoes because you wear it and use it every single day. 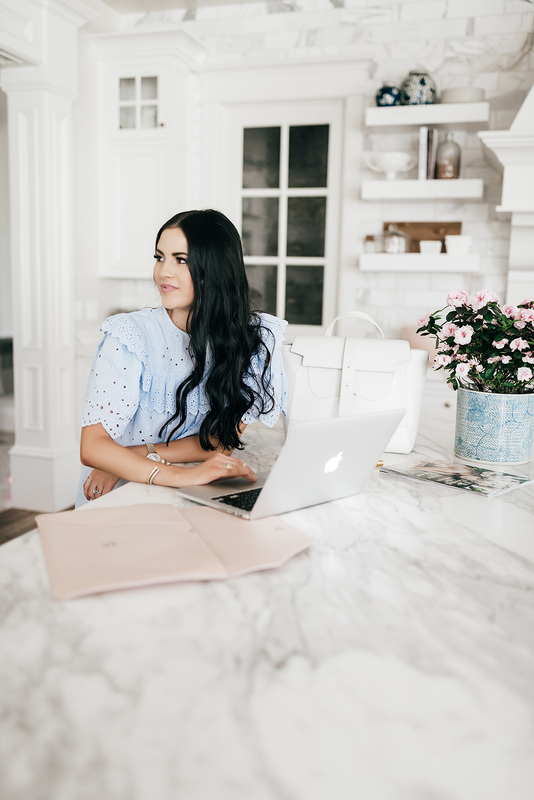 Recently I asked you guys what type of content you want to see more of on my blog and a few of you mentioned that you’d like to hear more about my collection of handbags, which bags are my favorite and if designer bags are worth the investment. 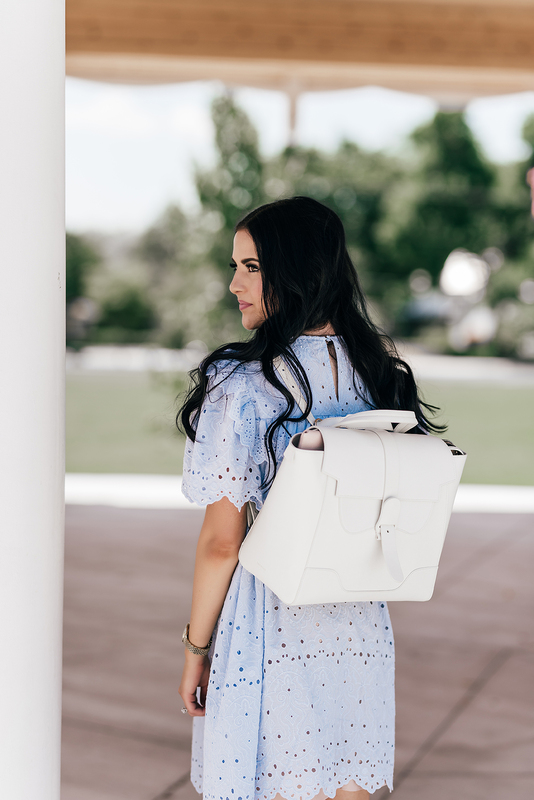 So today I’m excited to answer a few of your questions and talk all about my newest bag I just got for summer!!! ° I know it’s beautiful, but is it also functional and practical (especially being a mom of two)? ° How will it wear? ° Do I already have something like it? ° Will it keep me organized? ° Is it worth the investment? 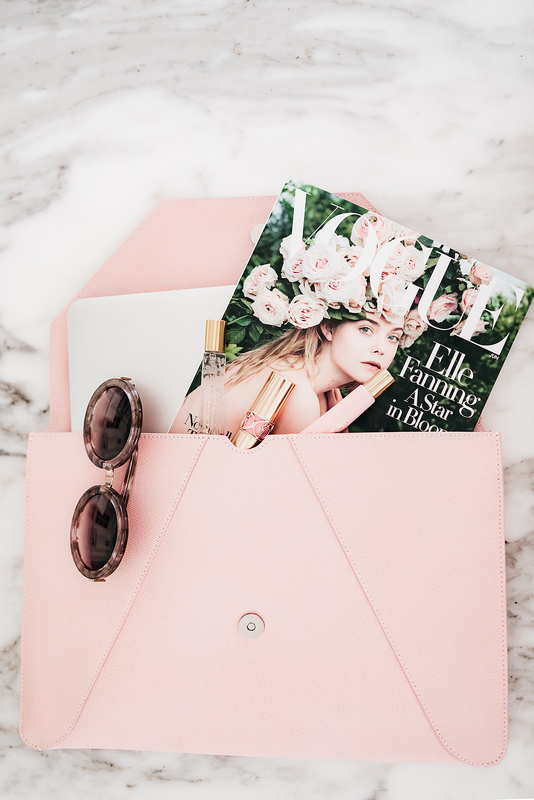 This Maestra bag and envelope from the new luxury handbag brand Senreve (made in Italy) checks everything on my list. The leather is pebbled so if you spill something on it you can wipe it off easy! 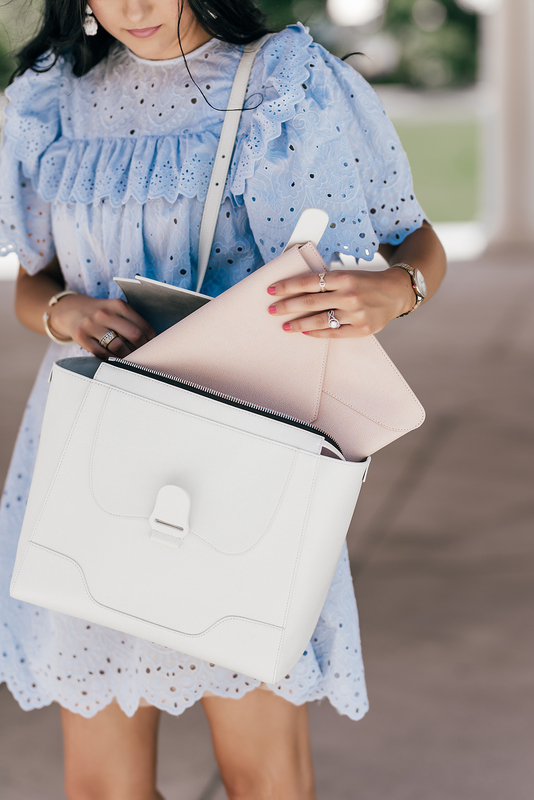 It can be worn three ways (crossbody, satchel and backpack) and there’s so many storage compartments to keep everything organized (diaper bag double). I don’t have a bag that can be worn three ways and it reminds me of a Celine tote only way less expensive with way more storage compartments!! Definitely worth the investment! Literally anything and everything you need fits in it: laptop, camera, snacks, magazines, small blanket, Diet Coke, cosmetic bag, etc. Lately I’ve been taking it to meetings because I love that my laptop and any fabric or clothing samples for my clothing line fit great. And I plan to use it as a carry on for my next trip! It’s seriously the perfect bag! 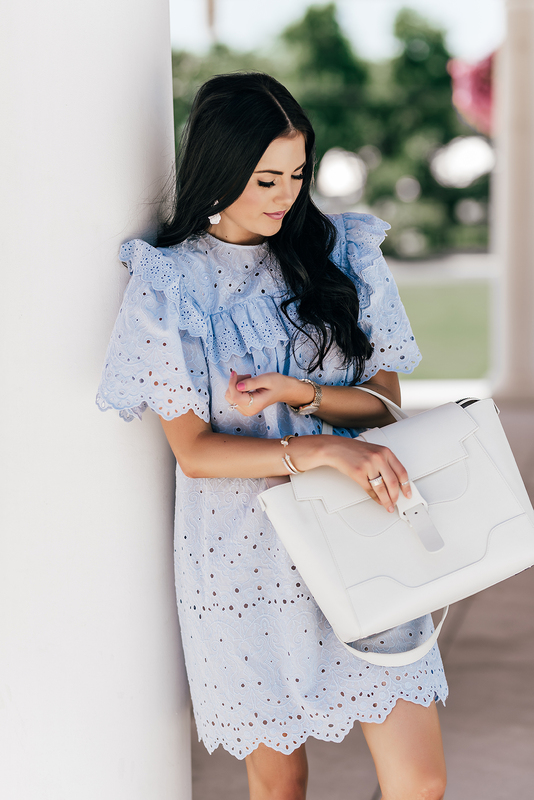 I’ll be sharing more about my favorite bags that I own in the near future, so stay tuned! And let me know if you have any questions about my Maestra! Brought to you by Senreve. Such a beautiful bag! I love all of the lighter colors that it comes in, so pretty for Spring and Summer!! Beautiful bag, well sized to get good use out of it. That Maestra bag is so cute! I loves its versatility and chic style! I love how different the shape of this bag is! It looks cool as a backpack and I love that there are so many slots to organize your things in it! currently running to H&M to buy that dress…..
It’s one of my favorite dresses!! 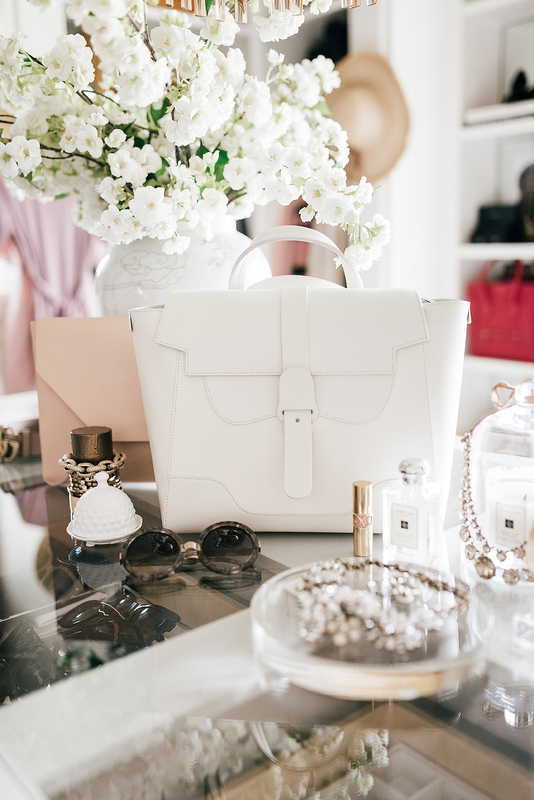 I absolutely adore this bag, definitely on my list of must-haves. Best part it will keep me organized and color assortment can be transitioned all year long. You will love it!!! It’s seriously amazing! These photos are so stunning!! Swoon worthy!! Looks and sounds like the perfect all around bag! Love that it can be worn 3 different ways, how unique. Those are such timeless pieces that will go with everything! I love that dress! I can’t believe it’s from H&M! I know!! Super cute and super affordable! I have this bag and absolutely love it! It goes perfect from work to weekend! It really does! I love it! I love the modern design and the fact that it can be worn 3 different ways, how cool! It’s definitely a perfect summer bag. Thanks for sharing, beauty, and I hope you’re having a great week so far! I love how pretty and functional this is! Thanks Amber!!! I know, all of these pockets are seriously a game changer! Me encanta tu estilo, lo amo. Es muy elegante, limpio y casual. Para alguna de mis actividades imito tus oufits ^^. Preguntas importantes y necesarias antes de comprar una cartera (bag) lo tendré en cuenta!! :) Besos desde Chile.. I can’t believe this dress is from H&M! Also, this bag is just too pretty!! Hi Rachel, I love, love your kitchen. Can you please tell me the type of marble you used? 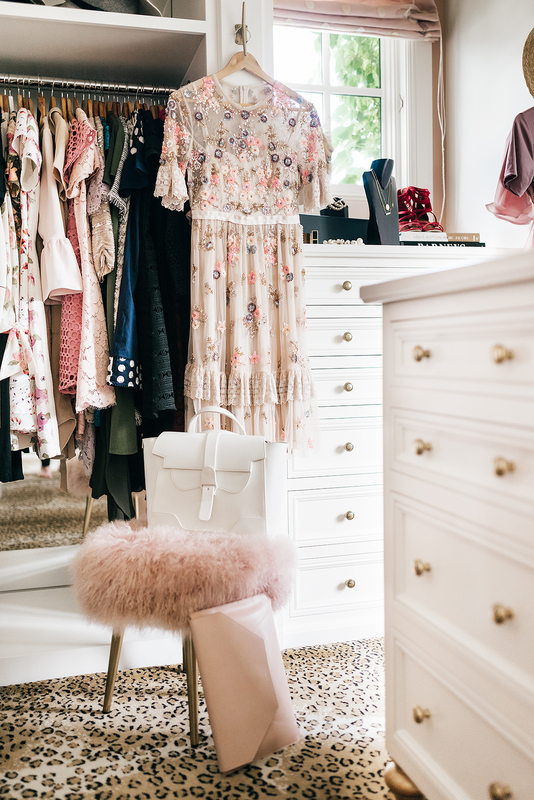 This is such a gorgeous bag and I’ve been looking for something like this style! What color would you recommend for a year-round bag?? I love the white but I’d like something a little more season neutral. Any suggestions for this bag? Thanks Awbrey!!! I’m loving white right now, but a tan or grey could be worn year round too! This bag is stunning! I love the sleekness of it. I think I would love it even more if it was black (I’m always afraid the white will get dirty). It looks like its the perfect size for a lot of things too. I love it girl! If you know of a similar one with a lower price, let us know! does it get heavy with the laptop? and is the laptop sleeve lined/padded? It isn’t lined but it’s a separate compartment which I love. And I haven’t noticed it getting too heavy! What size macbook can you fit in the sleeve? I’m looking at the same bag and wanted to know if I could fit my 15″. I have been lusting after this bag for a while and recently found out I’m pregnant. Would you recommend it as a main diaper bag? 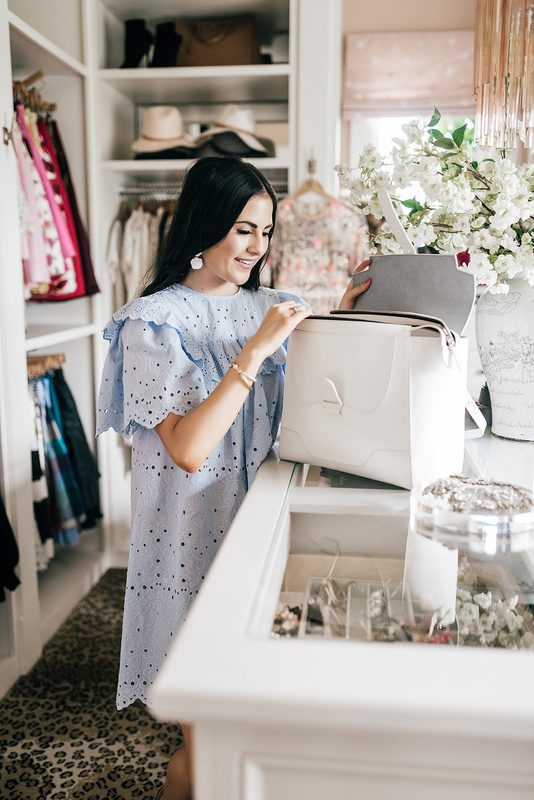 Do you have one dedicated diaper bag and then carry a separate purse for yourself, or do you swap it out? Then do you have multiple diaper bags so that a caregiver/hubby/grandparent has one to use? 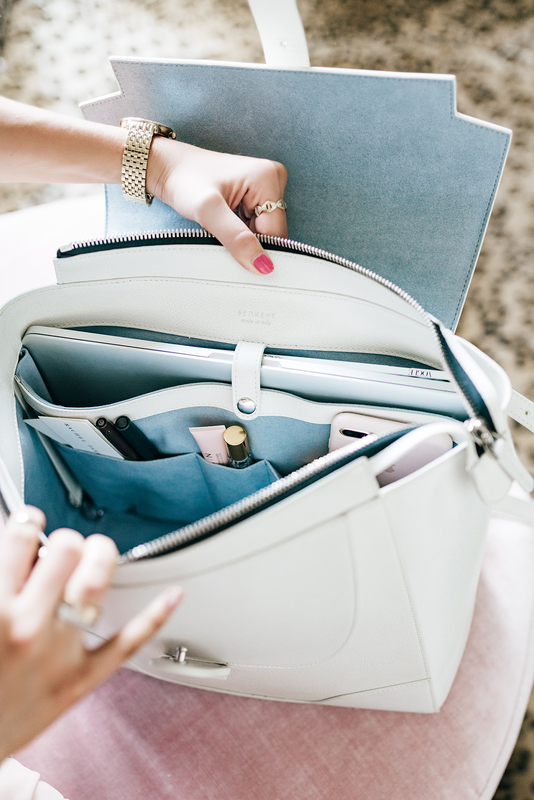 Who knew there could be so many things to think about just with a diaper bag! Congrats on your pregnancy!! Honestly I LOVE this bag and it could totally work as a diaper bag. I love using it as a carry-on too when whenever we travel. I don’t have one dedicated diaper bag that I use. Most often I use my designer bags and then just throw in whatever the babies need. But it’s not very organized!!! haha But yes, this is plenty big enough and you would love it as a diaper bag!